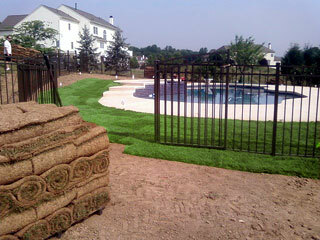 There are different types of sod to suit almost any job site. Kentucky Bluegrass is the most common type of sod sold. It is dark in color and used mostly for full sun areas. New varieties are developed each year to be more shade tolerant and All Purpose. Bluegrass sod still requires most of the day in full sun to survive. It also does better when it receives about 1 inch of water per week. During dry spells it will need irrigation to survive at its best. Tall Fescue sod is somewhat lighter in color, but is more shade tolerant and requires less maintenance. In areas that spend less than 75% of the day in full sun, this is the grass to choose. New varieties are darker and thinner than the typical Tall Fescues that most people are familiar with. 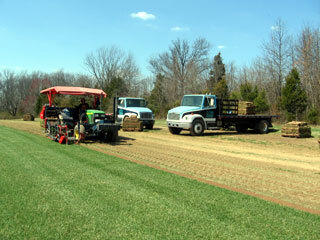 They begin to look much more like the Kentucky Bluegrasses preferred by most professionals. Fescue varieties also perform well in areas that receive less maintenance and irrigation. They survive periods of drought much better than bluegrasses. They are also more wear tolerant for high-traffic areas such as athletic fields or home play areas. Although somewhat lighter in color, they stay thick and lush and choke out weeds with ease requiring less fertilizer and upkeep. Both varieties are grown at our Wrightstown farm and at our Furlong farm and are available to view at any time. Simply call in advance and we will gladly show you our fields and discuss which variety is best for your site. Your new sod lawn will be one of the most visible and appreciated customizations you can do to your new home or renovated areas. Around new decks or pools or at your newly constructed home, a sod lawn is a great addition that you will appreciate every day. Let us spend the 18 months to two years it takes for seed to grow to sod quality. 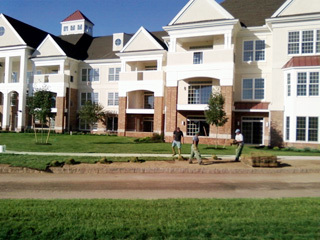 Your sod lawn will be beautiful by the end of the day its installed.